Lambertia formosa is a widespread plant of the Sydney Region. I planted this plant about 25 years ago in my garden in the northern Sydney suburb of Westleigh. It is now approximately 1.6 metres high with multiple branches coming from the base. It is still growing well even though it now receives only dappled morning light and some full late afternoon sun. As well, the soil is much drier very different to the full sun conditions it enjoyed in its early years. It receives no supplementary watering and after good soaking rains it rewards me with many flowers. 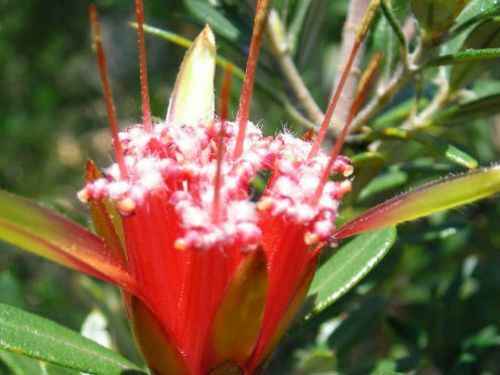 The main flowering time is spring and the flowers are erect and enclosed in red overlapping bracts and rich in nectar. Interestingly the plant only produces a few seeds, a pity as they are most interesting. This is a hardy plant worth growing for its interesting flowers and fruit. The common name, Mountain Devil, is named for the woody fruits which are bearded and horned. Lambertia: after Aylmer Bourke Lambert (1761-1842) English patron of botany. On an historical note: In the 1940s and 1950s, souvenirs were made from the fruit of this plant. Who can remember the pipe cleaner mountain devil dolls? Has the overuse of these seed pods resulted in a decline in plant numbers? 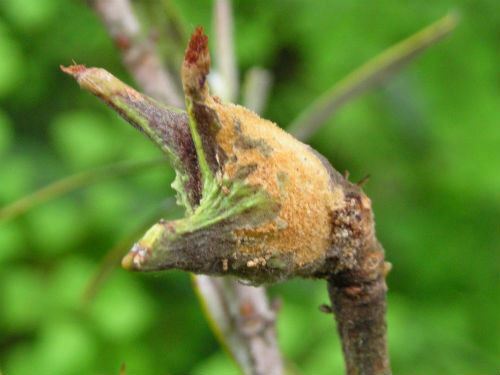 Photo 1-- an immature seed pod, it will change colour to brown when mature, note the seed has been nibbled at by a caterpillar, a common occurrence.